GWERU – The first ever state of the art private cemetery Destiny Memorial Park has been opened in Gweru. 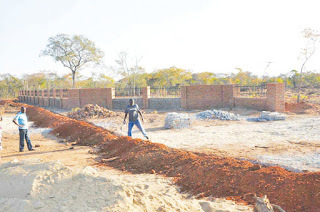 Destiny Memorial Park which is located two kilometres off Gweru-Harare highway along Chiwundura road is owned by a private land developer, True Destination Life. Runyararo Muzondo, one of the directors of True Destination Life said that the cemetery is now open for bookings and burials. “We are now open for bookings and burials at the cemetery. We are receiving quite a number of people who are buying burial space. We believe that the overwhelming enquiries are because people really want to get themselves decent burial space which is provided at Destiny Memorial Park..
“The graves will cost from $400 to $800 depending on the type of service and product that the client wants. “We have children section, standard section and premium section. All these types will offer different and quality services. He also said there were plans for future projects at the memorial park which include a chapel, full administration block, mausoleum (to cater for Muslims), scatter garden (for the cremated), memorial wall and generators for power backup. Muzondo said they also offer double burials in a single grave and family plots.